Somehow, without anyone noticing, Hot Chip have been canonised. They have attained the enviable position of widely appreciated curios, part of an apparent tradition of mild English eccentricity. For many listeners they are the Devo we never had; a band that are, according to a recent piece in The Guardian, on their way to becoming "one of the great British pop groups." Since 2010's One Life Stand Hot Chip's members have been pursuing their own projects. Alexis Taylor has helmed the fascinating semi-improv About Group, while Joe Goddard has further embraced the dancefloor by way of the charming 2 Bears and the world-conquering 'Gabriel'. In the publicity around their fifth album, then, there is a sense of heroes' return; of getting the old crew back together for one last job. They needn't have bothered. In Our Heads is the work of a band fresh out of ideas. It is the sort of record on which four-minute songs feel interminable; a record so half-hearted that it sounds like it was constructed with one hand while the band were doing other, more important things, like making toast or checking the football score. A record, in fact, for which it may be necessary to invent new synonyms for 'boring'. Let's start with the positives - because there are a handful. Opener 'Motion Sickness' begins in the vein of a Music For 18 Musicians offcut, with almost-human pulses sitting atop fidgety percussion and hollow, wooden keys. It is a small-screen opening that soon gives way to something more expansive: a grin-inducing pop song full of Mad Decent horns and melodies as hooky as any the band have written. Meanwhile at the tail end of the record 'Ends Of The Earth' shapeshifts with real fluency between the sort of cheap fantasy sound one imagines is favoured by people who wear Three Woolf Moon t-shirts without irony, and a genuinely brilliant technicolour refrain. The real jewel, though, is 'Flutes', a rare moment of texture in an otherwise thoroughly one-dimensional set. Its vocal samples come on like a skipping CD of American schoolyard chants, tripping over one another, one minute on the grid and the next hovering either side of it. And that melody, on which Taylor sounds unusually composed, uncharacteristically vehement; it is the record's central plank, the beam around which they almost threaten to build something interesting. But three good tracks do not an album make - and, unfortunately, this is the sum of the worthwhile moments on In Our Heads. Elsewhere the album is pure drudgery, remarkable only in its dullness. There is not a single original idea outside those three songs. Instead the band scrabble through a collection of suitably on-trend motifs, trying to construct a record from little bits of others. At their best, the remaining tracks on In Our Heads sound like self-plagiarism. 'Night And Day' is essentially a toothless rendition of 'Gabriel', its brash, tuberous bass causing pangs of nostalgia for the halcyon days of August 2011, back when Joe Goddard was fun. The spoken word section, just embarrassing enough to cause a slight twitch of the eye, could have been lifted straight from The 2 Bears' Be Strong - and from the evidence here, it seems that comedy monologues are best left to Goddard's comrade-in-Bears Raf Rundell. Elsewhere 'These Chains' seems plucked from the poppier outskirts of the deserted-industrial-estate 2-step sound that is currently so in vogue, its shuffling percussion seemingly having travelled to the studio on the top deck of the N12. 'Don't Deny Your Heart' was clearly found buried under some cardboard outside the Dirty Dancing studios, and 'Now There Is Nothing' belongs in the sort of West End musical that closes, unnoticed, halfway through its run. It's like a lucky dip in which the only mystery is the specific subgenre of tedium to which you will be subjected. Long gone is the quiet oddness of their previous work. On their first couple of albums Hot Chip seemed to be cataloguing pop, showing their appreciation for the records they love by indentifying their key tropes and reshaping them. Now it feels more like an attempt to compensate for their own lack of ideas - or, for that matter, of passion. The whole thing is so humourless, so dull - not because of some navel-gazing self-absorption, but rather because it sounds as if the band just don't know why they are there. In Our Heads has the feel of a record born of contractual obligation; not grudgingly so much as with resignation. It bodes ill, then, that this is the band's first for Domino. The most disappointing part is that Hot Chip occasionally flirt with brilliance. They've never been an album band of course, but there are still few experiences more joyful than hearing 'Over And Over' on a decent system when three pints tipsy. 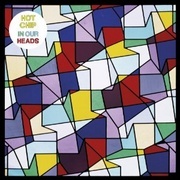 In Our Heads runs into The Warning on my computer, and in the opening bars of 'Careful' I am reminded that Hot Chip were once a band with great potential; a band with the ability to pack disparate, apparently non-tessellating ideas into a multicoloured package constructed as much for the dancefloor as for the living room. On In Our Heads the colour is gone, along with the ideas. Phenomenally unexciting.